sleigh full of other fun vintage Christmas ideas. Last year when I was still at Leola's in Ozark we had a Christmas party where we exchanged gifts from our space at the store. My friend Jeannie had this wonderful piece she had put together that I literally had drooled over. So when I found out she drew my name I begged for this little mailbox full of great vintage goodies. I have it setting in the Entry Hall right now, but I need to find a place to hang it on the wall, so it will be in a less precarious location. Some of my Thanksgiving "decor" bit the dust... whoops...bad location! This is one of my smaller trees that was really an "entry" topiary type tree. We bought it about six years ago when these smaller lighted trees first came out. This year I realized I was tired of the green and wanted a white or pewter colored tree. where she had hand painted a smaller tree white. Click above to read her great post! Carole's turned out gorgeous, but I opted for the spray paint route, with fairly good results. I used what I had and started with a mocha color to tone down the green, then a silver, next an off white, and then finally I took my trusty can of off white latex and brushed some on. Most of the ornaments are vintage Shiny Brites. I collect the whites, silvers, golds, and pastels. If they come with decorative flocking then all the better. I have a few small putz houses that found their way over to this tree. They aren't in as good condition, but I love them just the same. A sweet little angel tree topper. My friend Kenda and I spotted them at the same time at a swap meet two years ago. She picked them up first but was so sweet to share the bounty with me. She gave me two after I screamed and cried and threw myself on the ground (probably just to keep the attention to a minimum) Love ya Kenda! since most of my Christmas things are old. Yes, some of us are more "vintage" than others! Debra I love all the decorating that vintage box design is incredible, the victorian angels are so darling. I love the tree, postcards that is so unique and it looks amazing. You did an amazing job. The mailbox full of vintage ornaments is absolutely gorgeous!! And the tree is wonderful - I can't believe you painted it!! Great job. Debra the tree looks great. I love how the paint worked out. And the mail box is a lot of fun. I really have gotten into all the glitter the last couple of year. I don't know when I changed my mind about glitter. I don't think I had anything at all 2-3 years ago with any on it. This year I have bought 2 containers of it and have been working on some new glitz. I am crazy about the idea of using a mailbox for gathering and 'scaping! You have way more patience than me to paing your tree. Flocking is about as creative as I get! P.S. Some of us are more vintage than we care to admit! I can't imagine you throwing yourself on the ground... you are too cute honey. What a endearing post. So sentimental. Your tree is just adorable! wow...you have some really wonderful vintage Christmas treasures...everything looks great! I saw where Carole painted her tree and now you?! that takes some patience, it looks fabulous! love it! Debra, your comment on my blog made tears well up in my eyes... the difficult recipes was my favorite picture too. What would you do with that hare? we will have eternity to tlak about these things we blog about or will they even matter! I have grown to love your sweetness, Deborah, my favorite female Bible character, and Rahab. You are a gemstone in the crown. I love all of your vintage Christmas items. That box of goodies you received was a vintage lover's dream!!! And your tree was beautiful. I love seeing all of your Christmas decor. That mailbox has everything a person could want in their vintage decorating! It's so lovely. But what I'm most excited about is that tree that you painted! I've been thinking alot recently about the possibility of painting some of my small trees white, but I have been too chicken to try it. Now that I know it can be done, I can't wait to try it. Thank you, thank you!! Thanks for sharing such beautiful decorations and photos. Also, thanks for giving instructions on how you got the effect on your painted tree. I might try that myself one of these years. Love the old mailbox and ornaments! Debra, it is funny what you said about some of us are more vintage than others. Vintage is good:) Love your tree and all the detail, the paint and those precious little houses. The tree topper was certainly worth a little scrambling with a close friend over it:) Have a blessed day, a "Vintage" friend! All your decorations look great! That tree turned out fantastic! Enjoy the festiveness you have created! Such a nice box of goodies and I love your tree too! I am learning so much from all you gals who do vintage so well! The mailbox and the tree are beautiful! Your tree is gorgeous! I just love it! 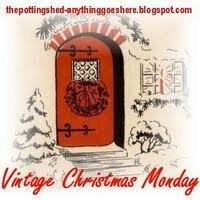 I am enjoying Vintage Christmas Monday! Thanks for your sweet comments on my last post. It was such a fun trip! I've been dying to get back to finish reading this post! Got a little busy here....which I'm not complaining about! The tree looks great and your vintage treasures makes the whole thing come together!Love the pot it's in too. Thanks for the mention too. .....you're a sweety! I adore that tree, but it wouldn't last 5 minutes in my house, Winnie would see to that! Oh my GOSH!!!! How BEAUTIFUL it all is!!! I'm a luvin' on the mailbox - how gorgeous! And your Tree? AH! Can I come sit under it please? pretty please? I promise, I won't make off with your GORGEOUS Angel!!! So beautiful - just like you!!! Hi Debra, your tree is so pretty. I love that you use all your old ornaments. I've always gone with unbreakable ones here, and I had to get the kitty out of the tree 3 times tonight so I'm glad they were plastic!